Over-all, DHID™ provides the Municipality/City clientele the Lowest Cost (<5 year payback), Most Proven (50,000+hrs. life, 90%+ lumen maintenance), Most Environmentally Responsible (re-use/retrofit fixture) Solution. To replace existing H.I.D. lamp fixtures with LED ‘one-for-one’ requires an IES Specification Redesign: due to LED technology’s lower lumens per Watt (light output versus energy consumed), and lower penetrating light over distance. Technically, higher Wattage, higher cost LED fixtures are needed; OR pole spacing needs to be closer (more posts added), and mounting height needs to be lower to match the performance of DHID™ lamp technology. Feature Article: Are LEDs still the future for lighting? 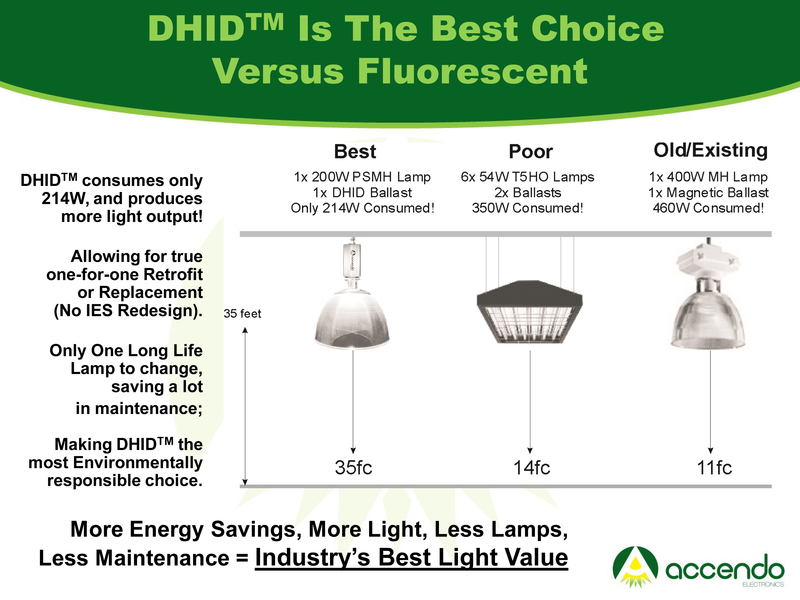 The new standard for high lumens applications, DHID™ (Digital HID™) Powered low/high bay fixtures are energy efficient, provide maximum light output, and cost less to operate compared to traditional (core and coil/magnetic) ballast fixtures. Ideally suited to Industrial, Retail or Public Space low/high bay lighting applications. The upgrade specification over magnetic ballast fixtures can yield 50%+ energy and operating expense savings. Brampton, ON, August 14th, 2012: Symban Lighting, Canada’s leading independent manufacturer of commercial and industrial lighting fixtures has partnered with Accendo Electronics of Markham, Ontario to deliver a broad line of energy efficient lighting products. This line of fixtures is the first available in North America to incorporate digital high-intensity discharge (DHID™) technology which reduces energy use by up to 50% without compromising overall performance, and while extending lamp life. Accendo Electronics is the World’s leading manufacturer of electronic/digital ballasts for high-intensity discharge lamps including pulse-start metal halide (PSMH), ceramic metal halide (CHM) and high pressure sodium (HPS) lamps, those used extensively in exterior and interior commercial and industrial applications. Traditionally, HID lamps are driven by magnetic ballasts which are inefficient, wasting large amounts of energy to released heat, and which degrade lamps, reducing their performance and shortening their useful life. Digital ballasts (or electronic ballasts) utilize a micro-processor to finely control the voltage and amperage levels and frequency delivered to lamps, resulting in less power consumed and extended lamp life. Heat losses are minimized saving additional energy. A typical 400 Watt exterior or high bay fixture can be reduced by up to 200 Watts by switching from magnetic to digital ballasts. As LED (light emitting diode) technology is seeing increased use in low-light applications, LED systems have yet to prove viable for high-intensity lighting applications. The light efficacy of LED systems (i.e. efficiency measured in terms of light lumens delivered per Watt of energy consumed) and their overall brightness has not matched metal halide technology. This, while remaining 3-4 times more expensive. In addition, manufactures of high-intensity discharge lamps have invested heavily to extend lamp-life and improve colour performance, rekindling interest in metal halide, ceramic metal halide and high pressure sodium lamps. It is expected that these developments, along with new DHID™ technology, will drive a renaissance in high-intensity discharge lighting from these sources. Symban Lighting is the first company to offer energy-saving DHID™ technology in a complete line of fixtures including wall-packs, flood lights, and canopy lights. These products will be made available through electrical and lighting distribution channels in Canada and the United States. Manufacturing Today magazine highlights how Industry Leaders can be more competitive by drastically reducing the expenses associated with facility Indoor and Outdoor Lighting; this can be done most cost-effectively, and without compromising light performance. We can help you increase your competitiveness in a most Economically and Environmentally Responsible way, please do not hesitate to contact us today to discuss. Accendo GloGreen Digital HIDTM (DHIDTM) retrofit ballasts and fixtures offer unparalleled electrical efficiency and light performance compared to conventional core and coil (magnetic) HID ballasts/fixtures. To re-use, or retrofit your existing ‘high-Wattage’ HID lighting fixtures with a more energy efficient ‘low-Wattage’ DHIDTM ballast and low-Wattage quality lamp makes sense from an Engineering point of view (light performance and lamp life is improved, with 50%+ energy saved); makes sense from an Accounting point of view (extremely short Return On Investment, in less than one year); and it makes sense from a Sustainability point of view (the re-use of existing fixtures makes sense for our Environment). Please contact us today to learn more about DHIDTM energy efficient lighting solutions. How does it work? Old magnetic ballast HID lamp systems lose their light output over time, eventually losing over half of their initial light output. Although light output has decreased, the magnetic ballast system continues to consume the same amount of energy. Accendo recommends the replacement of higher Wattage magnetic ballasts with lower Wattage DHIDTM ballasts. Below is a typical Industrial high bay light fixture retrofit example. The traditional 400W magnetic HID lamp system is upgraded/retrofitted with a 250W DHIDTM ballast, re-using the same fixture, only a new DHIDTM ballast and new matching Wattage lamp is installed. DHIDTM lighting retrofits can be applied anywhere a magnetic ballast HID fixture is existing, please do not hesitate to contact us for more information. High-Intensity Discharge (HID) Lighting remains the most cost-effective, most energy efficient, highest performing lighting source on the market today. Digital HIDTM (DHIDTM) Lighting Retrofit Ballasts are the natural, common sense upgrade for any existing HID lamp systems; the DHIDTM ballast is retrofitted/installed into the existing HID lamp fixture and ‘instantly’ reduces energy consumption by 40%-50% (75%+ with lamp dimming). – reduced waste, less Environmental impact by re-using fixture assets, and reduced lamp changes. Economically and Environmentally Responsible, the GloGreen Digital HIDTM Ballast retrofit solution is the only to meet all of your indoor and outdoor lighting needs with cost-effective, longer lasting light that will not degrade over time. With DHIDTM lighting products in 50W to 1000W configurations, and with readily available Industry Rebates/Incentives, DHIDTM is the common sense solution for Industry lighting projects today.